Nowadays, companies are taking their branding seriously that even the emails used by employees are already branded as the companies. This can be done by using a special mailing platform or by having a unique pattern of how one’s email address should look like which can also reflect the brand of the business. With the continuous usage of email as an efficient means of corporate communication, it is essential for employees to be aware of email policy and rules that should be strictly implemented from time to time. Using your email with your personal email signature is one thing, transacting with the corporate email assigned to you by your company is another. If you will be aware of the strict email policy rules, then it will be more beneficial for the business as they can be represented by emailing in the best way possible. This is the reason why creating strict email policy rules should be a part of the to-do checklist of the management of the business. We have listed a number of email policy strict rules and a few tips on how it can be more advantageous both for the business and the employees if they can honor and properly follow certain email policies and regulations. Email policy rules can clarify the scope and limitations of the corporate email’s usage. Employees tend to be unaware of facts about how they can use their corporate emails. With this, they commit mistakes that they do not even intend to do in the first place. Having an email policy can standardize the way employees use their emails which can cause lesser to no misunderstandings with the human resource department or the management. Strict email policy rules can help the business to formally present a policy clause to their employees. In a business, there are different policies that refer to different kinds of things and situations related to the nature of operations of the business, the expected deliverable of the employees, and the usage of the materials and tools of the business. If you will have strict email policy rules, then it will be faster and more efficient for the business to present an entire discussion about how employees are expected to use their emails during working hours. Maintaining professionalism during email transactions both in internal and external communications. As one of the touch points of various stakeholders to the business, the email of the business representatives plays a vital role when presenting an image to the people who would like to transact with the business. Discuss the ways on how your employees can be as professional as possible when transacting through email. This discussion may include the proper formatting of email messages as well as the usage of the company email signature format. Sending appropriate content that can produce no harm, violence, and threats to the expected email receiver. When using a corporate email, employees need to understand that all their actions can affect the business. As an example, if they will use the wrong tone of communication when addressing complaints and concerns, clients and customers can have lesser regards to the business which can directly affect sales, customer retention, and corporate imaging. Associating the values and core of the company in the usage of the corporate email to ensure the proper conduct of transactions. As a business entity, it is your responsibility to train your employees on how to properly use their emails. During talks and meetings about this matter, make sure that you can instill the values of the business to the expectations that you have in relation to the email usage. Developing a formal and business-like tone that is appropriate to be used in email messages to ensure that the brand of the business is still highlighted. How employees treat their expected email recipients is a reflection of how the business treats its stakeholders. Include proper email decorum in your email policy rules discussion. Email policy rules can easily organize the regulations of the business about email usage. Having strict rules about electronic mailing can help businesses ensure that employees are aware of their obligations whenever they plan to use their emails especially during working hours. Email policy strict are very important for the following reasons: You may also see quality policy. Email policy rules can limit the personal use of corporate emails. Strict email policy rules can limit the sending of letters and messages that can ruin the reputation of the business or can misrepresent the company and its management. Strict email policy rules can lessen the possibility of using the corporate email in illegal activities which can also be unlawful at the same time. Strict email policy rules can protect the private information that is only intended to be sent to specific recipients. Strict email policy rules can address issues related to email tampering and other instances where electronic mail confidentiality is at risk. Strict email policy rules create an open platform where the business and the employees can refer to should they have inquiries about the proper usage of their corporate emails. Make sure that you will have a regular monitoring of how the employees apply the strict rules and policy examples in their email usage. It is essential for the management to be aware that the people within the business honor the set of email policies as it can greatly affect the entire operations and the way that business representatives communicate with other stakeholders. If you will monitor employees accordingly, then you can have comparisons on the common mistakes that they do when it comes to using their emails. More so, you can have trends that can show you whether programs and meetings about email policy strict rules are effective enough. Describe how the email policy strict rules can affect certain transactions. Employees will not just follow everything that you say especially if they have no idea on how they or the business can benefit from what they will be doing. 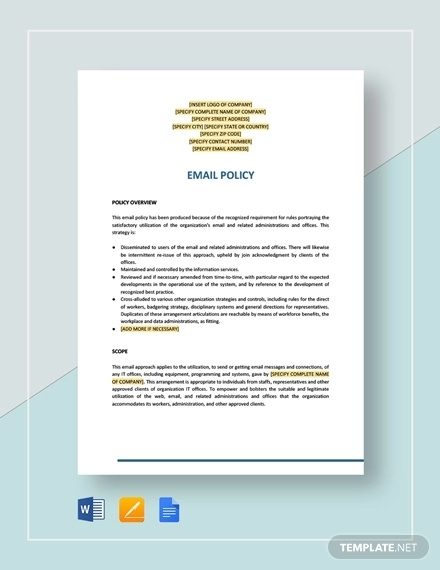 If you can briefly discuss the information about the full implementation of email policy strict rules, then employees can have a deeper understanding of why they need to follow certain email standards and rules. You may also see the training policy. Be concise with what you would like to discuss. It will be best if you can have a bullet-type discussion as it can point out the specific strict rules that employees need to follow. Being precise and direct to the point can help you engage the employees in a deeper manner when it comes to how you would like them to maximize the usage of their corporate emails without exceeding the limitations set by the business.